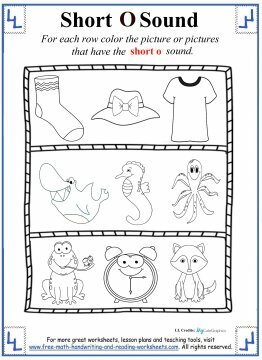 These short o worksheets focus on teaching the 'O' sound as it appears in the middle of words like fox, log, and cost. It also begins words like octopus, omelet, and olive. For more short vowel words, you should print out the list of short vowel sounds below. 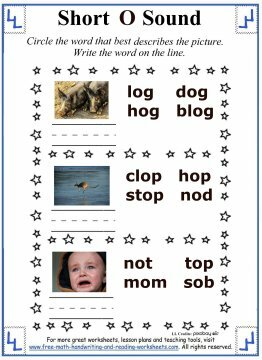 A good way to introduce the short vowel sound to your child is to print out the short vowel word lists that I created and spend some time going over the words on the list with your child. Be sure to stress the 'ah' sound that it makes and see if he or she can come up with other words. 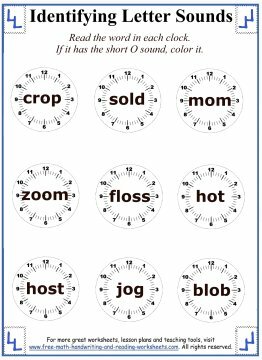 Below you will find six different worksheets covering the short vowel sound that 'o' makes. 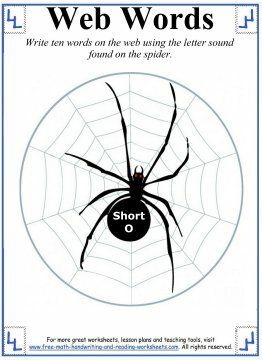 In the Web Words worksheet, students will need to write ten words (one in each section of the cobweb) that use the short 'O' sound. 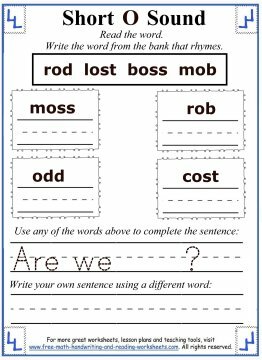 Older students may find it too easy to come up with ten words, so you may want to have them write as many words as they can using the blank spaces between the spider webs. The second paper has three rows of pictures. In each row, students will need to identify the object that has the short vowel sound 'o' and color it. 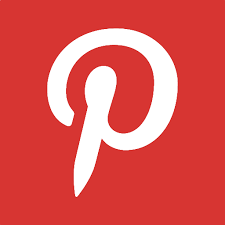 The third activity has nine pictures on it. 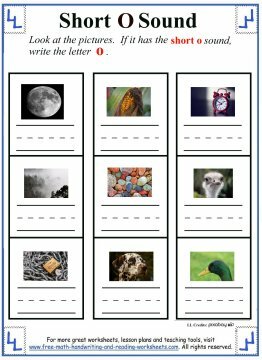 Name each object and if the word has the short vowel o, then write the letter 'o' on the line underneath the picture. You could also use this paper to work on writing skills. 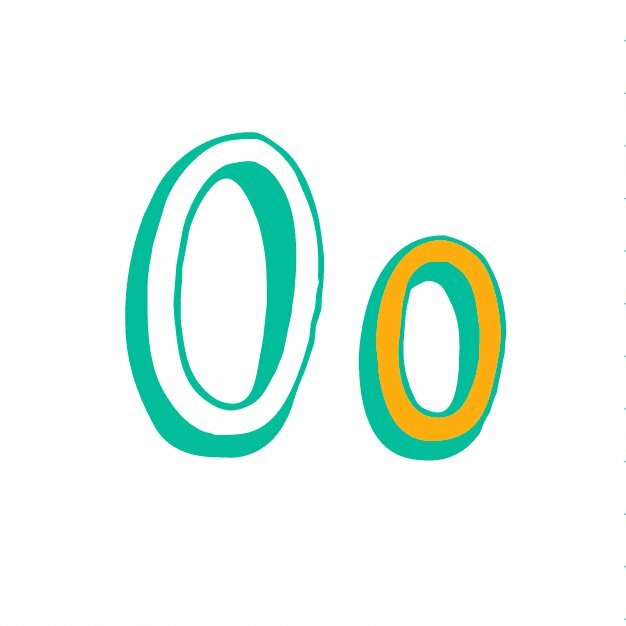 Instead of writing the letter 'o', you could have your student write the entire word out if it uses the short o sound. The next handout has three pictures with four groups of words next to it. 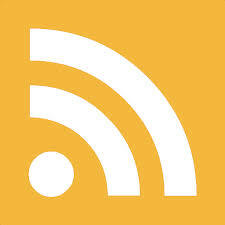 Circle the word that best describes the picture and then write the word on the line. The fifth worksheet has nine different clocks on it. Inside each clock is a word. If the word uses the short 'o' sound, then color it in. The last activity is rhyming activity. At the top of the page is a word bank with four words. Below that are four boxes with words that rhyme with one of the words from the bank. Write the word that rhymes in each box. Under that activity, there are two lines for writing sentences. In the first sentence, there is one word missing. Use a word from the bank to complete the sentence. On the next line, students will need to create an original sentence using one of the other words.